Inside, the Infiniti G35 takes full advantage of the FM-platform's long wheelbase and wide track, offering generous head, leg, shoulder, and hip room on all seats and a larger cabin than even the BMW 5-Series. As a result, the G35 is an amazingly comfortable car, despite its sporty ambitions. Designed with a bias on driver-friendliness, the interior is optionally fitted with leather-seating and genuine maple wood-tone trim, and comes with several clever features, such as an instrument cluster that moves with the tilt-adjusting steering-wheel for optimum vision of the gauges. Unfortunately, this option erases the possibility of a telescoping function for the steering device. 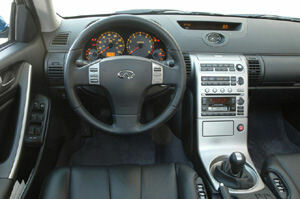 The leather-wrapped wheel itself provides a firm grip, and comes with convenient stereo control buttons. Featuring Infiniti's 'Fine-Vision' illumination system, the gauges are brightly lighted during the day and in effect easy to read under any conditions. Offering a high level of passive safety, the Infiniti G35 is factory-equipped with dual-stage supplemental airbags, front seat side-impact supplemental airbags, and roof-mounted side-impact curtain airbags for front- and rear-seat occupant head protection. Also standard are seat-belts with pretensioners and load limiters, and Infiniti's LATCH (Lower Anchors and Tethers for CHildren) system. Passenger-accommodation is by seats individually designed for their assigned position. The driver's seat has specifically been developed for enhanced support during fast cornering, using a center mound shape with high damping urethane foam and special spring design. The power-controls for its adjustment are a bit awkward, though, uncommonly positioned on the inboard bolster where they disturb during hard cornering, as the thighs could activate them. You might not have to use those switches that often, though, since a memory function for two drivers is offered, too. The front passenger's seat has a flatter-shaped lower cushion and is intended to provide a relaxed posture, even when folding or stretching one's legs. The rear seats are not less comfortable. On offer is a choice of standard wide bucket-shaped seats or more comfortable reclining seats (Premium package), both of which come with a pass-through center armrest and generally supply plenty of room to all sides, except if the front seats are set to the very back. The cabin is tastefully styled with sporty aluminum-look trim (optionally wood), featuring built and material quality that, although not on a par with European products, easily matches that of other (primarily Japanese) contenders in this class. Infiniti's trademark analog clock graces the dash, while a thin panel atop it houses digital readouts for compass, heating, ventilation, and air conditioning settings. The latter are quite difficult to read due to their size, as is the audio display. At least, Infiniti did not give in to the latest trend of linking the stereo and A/C to the nav-system's display. Instead, the automatic dual-zone climate control and audio system rely on large buttons which are convenient to use and within close reach of the driver. The stereo comes either in standard 6-speaker AM/FM/cassette disguise with an in-dash 6-disc CD changer, or in form of the Premium package's 200-watt 7-speaker Bose® system, with AM/FM/cassette in-dash 6-disc CD changer with RDS and speed-sensitive volume control. Especially the latter sounds great with crisp bass and highs. Storage space inside the car is primarily provided by two rather small glove boxes, one of which is occupied by the optional DVD navigation system, if ordered. The center storage bin is dual tiered, but in effect offers only little space. At least its top is padded so you can comfortably rest your elbow on it. There is another storage compartment on top of the dash, which provides a little space for wallets and the like, but in general is reserved for the 6.5-inch retractable and tiltable LCD display of the optional navigation-system. The navigation-system sports an easy to grasp "bird's eye" view of the selected area, instead of the usual flat-plane look. It is much easier to imagine one's route this way, because rather than merely showing an arrow on a static 2-D map, the system now displays a profile of the area you are in and highlights landmarks and other important points on the way you are heading. 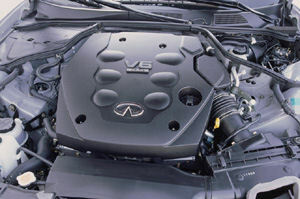 Power on the Infiniti G35 comes from the 3.5-liter DOHC 24-valve VQ35DE, a derivative of Nissan's ubiquitous VQ-engine series, which has been recognized as one of the "Ten Best Engines" by Ward's Auto World magazine for seven consecutive years now. Fully built of aluminum, this V6 produces a healthy 260 horsepower at 6,000 rpm and 260 lb-ft (350 Nm) of torque at 4,800 rpm, thanks to a long list of advanced systems, like continuously variable valve timing control, micro-finished crank journals and cam lobes, and molybdenum coated lightweight pistons. It also features a "noiseless" timing chain for silent operation and an electronically controlled "drive-by-wire" throttle system. So far, the power plant is mated to an advanced 5-speed, electronically-controlled automatic transmission with a manual shift mode, but soon after the introduction of the Nissan 350Z and G35 Sport Coupe, a 6-speed manual will be available, which should suit the car's dynamic character much better. Based on a four-wheel multi-link setup, the G35's suspension uses two separate lower links and a long upper link up front to minimize alignment changes. A design separating the shock absorbers from the springs by locating the former inline with the wheel center, in the rear helps reduce suspension friction and wind-up motion of the axle during acceleration. Intended to provide a smoother and more comfortable ride, the suspension utilizes aluminum components for reduced unsprung weight, and incorporates "ripple control" shock absorbers with damping control lips to suppress high-frequency, micro-amplitude vibrations. The optional sport-suspension features tauter springs, higher damping-rate shocks and wider 215/55 R17 performance tires. Decelerating the Infiniti G35 are 4-wheel vented discs, sized 11.7 x 0.9 in. (300 x 23 mm) up front and 11.5 x 0.6 in. (290 x 15 mm) in the rear. They are coupled to a 4-sensor Anti-lock Braking System (ABS), Electronic Brake-force Distribution (EBD), to distribute the brake force depending on load condition (passengers and cargo), and Brake Assist, which senses hard or panic pedal application and to provide maximum braking capacity. Laser welded roof- and body-side-panels, in conjunction with a dual bulkhead engine compartment construction result in superb structural rigidity, and enable the entire body to function as a damper for vibrations. Driving stability, ride comfort, and noise reduction should benefit from these enhancements. Mizuno, leader of the V35 Nissan Skyline and Infiniti G35 design-group, put a high emphasis on aerodynamics, particularly on the control of airflow below the body. A flat undercarriage, extensive use of diffusers and the optional rear-wing, in correspondence with the sleek bodywork, return an exceptionally low drag-coefficient of 0.26 (0.27 without the optional rear-wing) and zero aerodynamic lift front and rear.